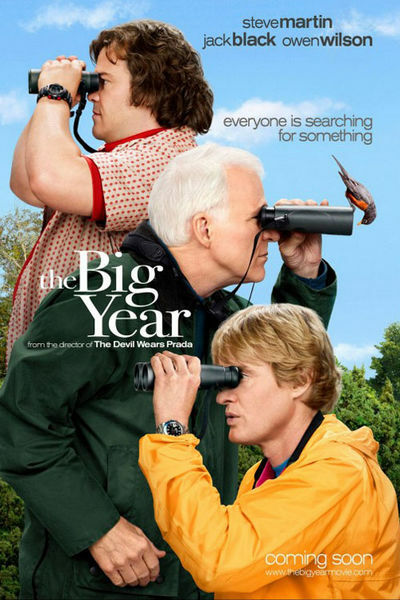 I just got back from attending an advanced screening of "The Big Year". I've promised not to officially "review" the movie until Friday, so you'll just have to come back and visit this blog as soon as Thursday turns into Friday. But let me tease you about my upcoming review. And I'll refrain from discussing characters and plot and just share my "general impressions of shape and size". I really enjoyed it. It made me laugh a lot, it almost made me cry a couple times, it made me cringe a few times, and it taught me a few things about life. You're definitely going to want to see it! P.S. There are loads of bird inconsistencies which will be fun to list when it comes out on DVD, but don't let them get ya all bent outta shape...we'll have fun with that later. Go to the theater to enjoy the story and laugh at yourself a bit. Oh, and take some non-birding family and friends...they will enjoy the movie as much or more than you. Yes, a must see for sure. Looking forward to your official review! Hoping to go see it with Dawn Fine!